(Photo Caption: Choi Yu, Rev. Heng Sure, Imee Ooi, Yvette Kang) there was any chance to meet with Imee and it happened. I spoke with her for three hours on Sunday evening, before my return to the US and I learned more about her music. Imee takes chants, sutras, mantras and sacred names and sets them into melodies that she composes. The composing, arranging and performing are all done by her, including multi-track vocals. The result sounds ethereal and tranquil, but not syrupy or boring. Her melodies are fresh and moving. She now has completed twenty-one CDs of well-known Pali, Sanskrit and Chinese based texts, including collaborating as composer on three musical stage productions using Buddhist themes. You can find an interview with Imee and her co-producer, Choi Yu, at this link. Imee's compositions are played regularly in Asia and the West, and have helped carry the sound of the the Buddha's words into secular venues: yoga studios, hospices, birthing clinics, even operating rooms in hospitals. Thank you for sharing this. I recognize the Great Compassion Mantra song that I used to play in my car. I received some CDs but never knew anything about the singer. Since the CDs came from Taiwan, I always thought it was a Taiwanese singer. It's wonderful to be able to match the music that I really enjoy with the person behind it. Quite a treat ; ). Please make more Buddhist music. Thank you. I love her compositions and would hope some day her recordings would be easier to get in the west. Perhaps some day Rev Heng Sure and Imee Ooi would do a recording together!!! That would be awesome! Su música me relaja. Es grandioso conocer música tan especial a través de internet. Nos acerca, nos une y nos enseña de otra manera nos es más difícil por no decir nos imposibilita. Imee Ooi is an awesome talent!! Her music is wonderful, rich and diverse, with a serene heart. What a special, radiant and talented woman she is!! I've always enjoyed Imee Ooi's music especially Metta Chant. Finally I can put a face to that name. May you always continue to make beautiful music for the Buddhist world! 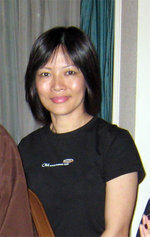 I appreciate all imee ooi hard work's for bringing a good buddhism music around. All beautiful, inspiring and bring serenity. I hope in the future not only chanting music are available for us, but also a kind of music that describes the general teaching of the Buddha such as : the four noble truths, the eightfold noble path, the three characteristic of existences: anicca, anatta, dukkha, or about karma and rebirth explained in simple wordings, so that buddhists who know buddhism well can always be reminded of His teaching and buddhists who still don't understand buddhism well can be inspired. So that music somehow can be dharmadana too. May all your hard works yield good results. The only thing I don't like is when her music stops. Thank you Imee Ooi I appreciate your contribution to Buddhism and Buddhist chanting and musical world.